Do you have sensitive gums, bleeding gums, bad breath or loose teeth? You may have periodontal disease with receding gums, a condition where the margin of the gum tissue that surrounds the teeth wears away. As the gums recede, pockets can form between the teeth and gum line, and bacteria can build up in these gaps. This bacteria causes gum or periodontal disease, and can lead to tissue damage, bone structure damage and tooth loss. The Collegeville Gentle Dentist offers surgical and non-surgical receding gum and periodontal disease treatment. 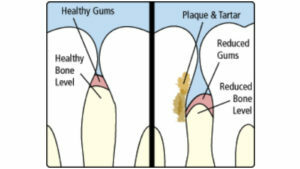 We use TwinLight™ Laser Assisted Therapy to painlessly remove diseased gum tissue and promote healing. Like LANAP® and other laser treatments, TwinLight™ laser therapy is a gentle procedure with no cutting or stitches. Depending on the treatment needed, we also provide gum grafting, deep scaling, root planing and sealants to treat periodontal disease. Contact us to learn more about receding gum and periodontal disease treatments. If you have any of these symptoms, contact our office for a consultation. Some people are more susceptible to receding gums. Receding gums can be caused by genetics, periodontal disease, plaque caused by inadequate brushing and flossing, hormonal changes, smoking or a misaligned bite. To prevent receding gums, brush your teeth with a soft bristle toothbrush and floss your teeth every day. Visit the Collegeville Gentle Dentist at least twice a year for professional dental cleaning and routine examinations.